Seriously??? They call this an avios card. And l am irish. Am so ashamed even trying to discuss avios with my family and friends who are REALLY interested in this hobby. They see how it works for me. But, as you say, the cc market is very poor and competitive in Ireland. As for no bonus, the card is not even worth the description on paper. Such a shame, as lots of irish biz folks travelling far and wide from Dublin these days. Would like to refer them for am amex card, even with the exchange fee, they would do far better. Wonder if this is possible? At least that way they could be linked to the BAEC, and benefit the way we all do. Gold Circle was always hard to deal with anyway, and AerClub staff haven’t a clue even now. It’s always been dark ages and hard work dealing with EI FFP. Gave it up years ago! Amex is not generally available in ireland. I am lucky and have one issued years ago when you could get one directly from Amex. Now they only issue them via a partner bank, and, unbelievably, they are not allowed to tell potential customers what bank that is! If you can guess the name they will confirm but for legal reasons they aren’t allowed to name the bank. I have tried to find out, many times, what bank they partner with and have not been able to. It isn’t any of the usual ones (BofI, AIB, Ulster). Does anyone know? Comment#5 at https://www.tripadvisor.com/ShowTopic-g186591-i88-k10468943-Credit_cards_American_Express-Ireland.html from 2017 suggests that it is TSB. Will Amex Brighton issue a EUR-denominated ICC? That is their explicit offer for some other countries where they are not established. There is also https://www.miles-and-more.com/online/portal/mam/de/earn/credit_card/offer?nodeid=206626777&l=en&cid=18002 which is in the right currency for IE. Unusually, the application form offers a drop-down of all countries. They ask for TaxID, so perhaps this only works where credit-reference agencies hold and share that (does anybody know which countries that is?). ID check does involve going to a German post-office. I have not yet managed to be accepted, but I think that’s because I have no credit record at the relevant address. I have a (UK born) friend who now lives permanently in Bermuda. He still has a UK bank account. He could possibly use his parents UK home address. He has both UK and Bermuda passports. Is there a way for him to get into this game? Hmmm I would say applying with his UK address would be crossing the line legally. Others might say it is fine. Even then it is tricky, you can indicate a UK address on an amex application, but then have to put a Bermuda employer etc? Not sure it will work. It should be fine, I took out a new Amex UK card around 6 months ago, gave them my UK address and Australian employer details and converted the salary to GBP, they were happy with it. I was an existing customer and still held Amex UK cards at the time, a new applicant might be different, unless they hold an Amex in Bermuda already. Do you mean they were actually happy with it, or they just hadn’t programmed their online form to truly validate employer details? Well I don’t know, but they’re fully aware of my dual residence! I can’t imagine Amex has a problem with it. It’s pretty common for Canadians to get US Amex cards using the address of a local cross border mailbox (and Amex will change the address to your Canadian address after the first card, they just have to sent the first one to a US address by law). This isn’t really any different. Woeful. Been waiting for something like this for years and this is the derisory offer they come up with it. Perks probably just about match the outlay. But the idea of having to rely on EI to call you back etc….forget it. Such a shame really as others have pointed out. yeah, the idea of waiting for EI to call you back is a joke. i’m currently trying to covert an EI voucher from EUR into GBP (as voucher has to be in the booking currency to use on their website) … originally requested the conversion two weeks ago … have now been told it will be another two weeks ! at that rate, you’d have no hope of managing to get hold of a flight that you actually wanted to take !! Should they not have taken the opportunity to plaster their new logo over it? Wow. Was going to send this to my Brother who lives in Ireland but upon reading it he’d admonish me for wasting his time with such a lame card (not the article !!). 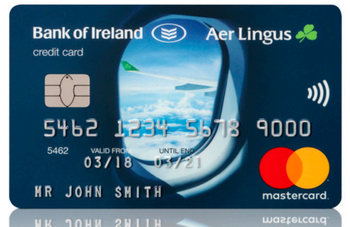 Until there is competition in Ireland for Avios earning cards the offer won’t be good. Indicator of imminent property crash, I suspect. Ireland’s bankers can always be relied upon to get their timing wrong. Can’t wait for AIB’s response. Thanks Rob, excellent analysis. Agree with everything you say. I won’t be getting this. I plan to sign up for the international version of the Amex platinum when I close my UK Amex cards shortly. I’ll be advising anyone that asks not to get the Avios card either. While it’s good to see some new-ish ideas, the execution is poor. As for competition, there really isn’t any. Ireland is terrible for credit cards. Are credit cards widely accepted in shops, restaurants etc in Ireland. Hoping to do some travelling in our caravan in Ireland if not this year then maybe next. Visa and MasterCard are extremely widely accepted. About the same as US or UK, say. The exception is Amex, which is NOT generally accepted except in reasonably upmarket restaurants and most hotels. Don’t rely on it being accepted anywhere. Liz, l use my amex in a lot of places near Dublin, when visiting family. I always ask if they take it, and plenty accept it. Bigger petrol stations and larger supermarkets all ok, some restaurants. Obs the forex fee is charged.. I had far more success using my Lloyd’s Amex than my curve mastercard in Dublin. That’s what happens when there’s really no travel credit card competition. My daughter has just moved to Zurich (as an intern) is there an obvious good credit card to get while she is there? Will a new resident (who is probably not a Swiss citizen) qualify for a credit card? Interesting article with EI “free flights” x 2, including Belfast in their departures. I use EI out of DUB regularly for nipping over to Lanzarote but during school times, so blackout dates above not encouraging. Normally 34.000 Avios and approx. £170ish tax with no perks, other than 2 x bags. EI IT is absolutely crap – input a date of birth wrong in my profile when linking Aer Club up with Avios and it took 4 phone calls and 3 emails over 46 days to change it 1 day to correct it !! More importantly will it be “Curveable” as a FX no fee card for spend abroad post Br&@it……? Don’t live in Ireland, but I’m planning to go to Dublin in the spring. Useful info that amex isn’t accepted widely. Thank you. Always worth asking, use mine a lot over there. Ah ok. There does seems to be a bit of a debate on travel forums as to how widely accepted amex is! Thanks for the clarification both. Not really a problem for me, as I’ll just use a Tandem cc and get cash back and 0% fx fees! The Irish market is woefully uncompetitive. Most banks have a monthly fee for a basic current account AND fees per transaction. This card needs to be seen in that context. Would the Iberia Icon card not be a decent option for anyone who could get one? I think a Spanish address is necessary and payments within the Euro area should be charged at the same as domestic bank transfers. But if you had a reasonable grasp of Spanish and an address there, that’s the card I’d be looking at. OT Amex is restricting the use of their Centurion Lounges for Platinum Card holders. One biggie is that you’ll no-longer be able to access the lounges at your final destination. Yeah they seemed to be swamped by customers, not surprising given the state/cost of many US lounges! Limited to 3h prior to departure for entry now too. Anyone not seeing the resemblance between the card image on this card and the old Virgin Arlantic MBNA cards. Now you mention it …. I also just realised that Google searches for Aer credit card throw up results discussing the AER interest rate!